The MultiConnect® DragonflyTM (MTQ) cellular system-on-module (SoM) is a ready-to-integrate processing and communications device that offers developers the functionality of a SoM with the convenience of an onboard cellular radio all in one compact design. 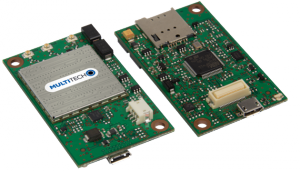 Models with the integrated ARMÂ® CortexÂ®Â®-M4 processor allow developers to host their application and have access to a full suite of interfaces for connecting sensors or other remote assets. Dragonfly features an ARM mbedTM compatible software library for faster development. All Dragonfly software is Open Source. For help updating MTQ firmware, go to Flashing MTQ Firmware.